Farrar, Straus and Giroux, 9780374113094, 512pp. "Welcome to Rockwell Land," writes Deborah Solomon in the introduction to this spirited and authoritative biography of the painter who provided twentieth-century America with a defining image of itself. As the star illustrator of The Saturday Evening Post for nearly half a century, Norman Rockwell mingled fact and fiction in paintings that reflected the we-the-people, communitarian ideals of American democracy. Freckled Boy Scouts and their mutts, sprightly grandmothers, a young man standing up to speak at a town hall meeting, a little black girl named Ruby Bridges walking into an all-white school—here was an America whose citizens seemed to believe in equality and gladness for all. Who was this man who served as our unofficial "artist in chief" and bolstered our country's national identity? Behind the folksy, pipe-smoking façade lay a surprisingly complex figure—a lonely painter who suffered from depression and was consumed by a sense of inadequacy. He wound up in treatment with the celebrated psychoanalyst Erik Erikson. In fact, Rockwell moved to Stockbridge, Massachusetts so that he and his wife could be near Austen Riggs, a leading psychiatric hospital. "What's interesting is how Rockwell's personal desire for inclusion and normalcy spoke to the national desire for inclusion and normalcy," writes Solomon. "His work mirrors his own temperament—his sense of humor, his fear of depths—and struck Americans as a truer version of themselves than the sallow, solemn, hard-bitten Puritans they knew from eighteenth-century portraits." Deborah Solomon, a biographer and art critic, draws on a wealth of unpublished letters and documents to explore the relationship between Rockwell's despairing personality and his genius for reflecting America's brightest hopes. "The thrill of his work," she writes, "is that he was able to use a commercial form [that of magazine illustration] to thrash out his private obsessions." 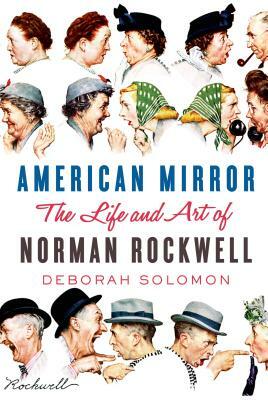 In American Mirror, Solomon trains her perceptive eye not only on Rockwell and his art but on the development of visual journalism as it evolved from illustration in the 1920s to photography in the 1930s to television in the 1950s. She offers vivid cameos of the many famous Americans whom Rockwell counted as friends, including President Dwight Eisenhower, the folk artist Grandma Moses, the rock musician Al Kooper, and the generation of now-forgotten painters who ushered in the Golden Age of illustration, especially J. C. Leyendecker, the reclusive legend who created the Arrow Collar Man. Deborah Solomon is the author of two previous biographies of American artists: Jackson Pollock: A Biography and Utopia Parkway: The Life and Work of Joseph Cornell (FSG, 1997). She has written about art and culture for many publications, and her weekly interview column appeared in The New York Times Magazine from 2003 to 2011. She lives in New York with her family.